Summary. Background: The development of hormone-dependent cancers, including endometrial carcinomas, in great part may be mediated by the genotoxic effects of estrogen metabolites, among which 4-hydroxyestradiol (4OHE2) is characterized by the most prominent DNA-damaging properties. It is assumed that the individual sensitivity to the 4OHE2 may determine the predisposition to endometrial cancer (EС). Aim: To analyze the sensitivity of peripheral blood lymphocytes (PBLs) of EC patients to the 4OHE2 and to evaluate the repair efficiency of 4OHE2-induced DNA damage. Materials and Methods: The study was performed on the PBLs of 53 EC patients and 20 healthy women. The level of DNA damage was measured using the comet assay and was expressed as % tail DNA. The DNA repair efficiency (%) was evaluated by determining the ratio between the amount of repaired DNA damage and the level of 4OHE2-induced damage that appeared after incubation of PBLs with 4OHE2. Results: In PBLs of EC patients, a higher level of 4OHE2-induced DNA damage (32.0 ± 2.2% tail DNA) and lower DNA repair efficiency (34.0 ± 4.5%) was observed compared to PBLs of healthy women (22.3 ± 2.3% tail DNA and 48.8 ± 4.5%, respectively). PBLs of EC patients with deep tumor invasion of myometrium were characterized by more prominent decrease of DNA repair than those with less invasive tumor (< ½ of myometrium) (20.9 ± 7.8 and 43.7 ± 6.7%, respectively). Furthermore, lower DNA repair efficiency was detected in the PBLs of EC patients with a family history of cancer compared to this parameter in patients with sporadic tumors (20.9±7.8 and 47.1 ± 5.5%, respectively). Conclusion: The PBLs of EC patients are characterized by increased sensitivity to the genotoxic effect of 4OHE2 and reduced repair efficiency regarding 4OHE2-induced DNA damage. A lower level of DNA repair is observed in EC patients with deep tumor myometrial invasion and a family history of cancer. Abbreviations used: 4OHE2– 4-hydroxyestradiol; BMI — body mass index; COMT — catechol-o-methyltransferase; EC — endometrial cancer; FH — family history; GSTP1– glutathione-S-transferase 1; PBLs — peripheral blood lymphocytes. Numerous studies have established that the genome of tumor cells is constantly exposed to a variety of effects that are realized with increased speed as genetic abnormalities . The latter manifest themselves at different levels of the genome organization and occur both in individual nucleotides and in chromosomes. Present knowledge suggests that the genome instability is not only a key sign but also a driving force of carcinogenesis which causes intra-tumoral heterogeneity and progression of the neoplasm [2, 3]. A number of studies have shown that in addition to tumor cells, the destabilization of the genome is also observed in somatic non-malignant cells of cancer patients, in particular, in peripheral blood lymphocytes (PBLs) [4–7]. It is believed that the level of genome instability is determined by a combination of various factors, among which the individual sensitivity to genotoxic agents and the efficiency of DNA repair may be of considerable importance [8, 9]. There is an assumption that the degree of genome instability in the cells of the body is affected by the peculiarities of estrogen metabolism. It is known that metabolic transformations of estrogens occur through their oxidation to highly active electrophilic intermediates — catechol estrogens, quinones and semiquinones, which have genotoxic properties . Estrogen metabolites are able to directly bind to DNA, leading to the appearance of apurinic sites, or to enter into redox cycling, generating radical oxygen species, which cause various DNA damages. Among catechol estrogens, the highest genotoxicity is inherent to 4-hydroxyestradiol (4OHE2), which is produced by cytochrome CYP 1B1 [10, 11]. It has been established that endometrial cancer (EC) patients are characterized by the disturbance of the ratio of circulating estrogen metabolites in the blood and the predominance of 4OHE2 among them . Genotoxic impact of estrogen metabolites on various cell types, including cancer cell lines, has been the subject of active study over the past few years [13–15]. However, the effect of 4OHE2 on somatic non-malignant cells of EC patients, in particular, on PBLs remains insufficiently studied. The importance of such studies is that elucidation of the mechanisms of action for estrogen metabolites will allow both to broaden the understanding of the pathogenesis of hormone-dependent tumors, including EC, and to evaluate the contribution of 4OHE2 to the genome instability of EC cells. The latter may be considerably important for identifying women with a hereditary predisposition to EC. It is known that the occurrence of EC can be associated with hereditary syndromes caused by germinal mutations in tumor suppressor genes, including the mismatch repair genes in Lynch syndrome and the PTEN gene in Cowden syndrome . At the same time, to date, it has been found that hereditary predisposition to EC can also be provoked by other, not yet fully clarified molecular mechanisms [17, 18]. One can assume that inherited hypersensitivity to estrogen metabolites can contribute to predisposition to EC. Therefore, the search for approaches to evaluate such sensitivity is necessary. The present work is devoted to the analysis of the sensitivity of the PBLs of patients with EC to the 4OHE2 and to the evaluation of the repair efficiency of 4OHE2-induced DNA damage. The study was performed on the PBLs of 53 EC patients (stage I–II) with a histologically confirmed diagnosis of endometrioid carcinoma. All EC patients underwent surgery at the Department of Gynecological Oncology of the National Cancer Institute, Kyiv, Ukraine. As controls PBLs from 20 healthy women were used. The mean age of EC patients was 58.6 ± 3.4 years, healthy controls — 51.1 ± 6.9 years. All women provided informed consent for participation in the study that was approved by the Committee for Ethical Issues of the R.E. Kavetsky Institute of Experimental Pathology, Oncology and Radiobiology, National Academy of Sciences of Ukraine. All EC patients were interviewed to reveal their family history (FH) of cancer, in particular, occurrence of malignancy in the family, type of tumor and the age at diagnosis of the affected family member. The criteria for referring of the EC patients to the group of individuals with a FH of cancer was the presence of malignant tumors of female reproductive system and other Lynch-associated tumors in first and second-degree relatives. where % tail DNA after 4OHE2 treatment is % tail DNA after 17 h of PBLs incubation in RPMI with 4OHE2; % tail DNA after repair is % tail DNA after washing PBLs with RPMI and incubation in fresh RPMI medium. All data were analyzed using the Statistica 8.0 software package (StatSoft, Inc.). 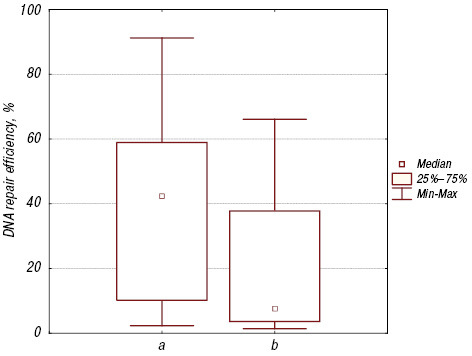 Nonparametric Mann — Whitney U-test was used to compare differences between the examined groups. A p-value less than 0.05 was considered statistically significant. It was found that the level of baseline DNA damage varied significantly both in EC patients (1.1–20.5% tail DNA) and in healthy donors (1.5–9.2% tail DNA). When comparing the mean values, significantly higher level of baseline DNA damage was observed in the PBLs of EC patients (7.9 ± 1.0% tail DNA) than in PBLs of the control group (3.8 ± 0.5% tail DNA) (p < 0.05) (Table 1). Photographic images of DNA comets reflecting the levels of baseline DNA damage in PBLs of EC patients are presented in Fig. 1, a. Note: *significantly different from healthy donors (р < 0.05). After incubation with 4OHE2, a large heterogeneity was observed in the amount of induced DNA damage in lymphocytes of EC patients (8.1–57.8% tail DNA) and healthy donors (7.9–46.8% tail DNA). The average level of 4OHE2-induced DNA damage was equal to 32.0 ± 2.2% tail DNA in patients with EC, while in healthy women it was significantly lower — 22.3 ± 2.3% tail DNA (p < 0.05). DNA comet images representing 4OHE2-induced DNA damage in PBLs of EC patients are shown in Fig. 1, b. Analysis of the repair efficiency of DNA damage caused by 4OHE2 showed that the PBLs of EC patients have a wider range of this parameter (1.3–91.2% tail DNA) than the lymphocytes of healthy donors (7.1–69.8% tail DNA). When comparing the average values of the DNA repair efficiency, significantly lower level of repair was observed in PBLs of EC patients (34.0 ± 4.5%) compared to healthy women (48.8 ± 4.5%) (p < 0.05). Photographic images of DNA comets representing DNA damage remained after repair in PBL of EC patients are given in Fig. 1, c.
The obtained data on the levels of baseline, 4OHE2-induced DNA damage and DNA repair efficiency in PBLs were analyzed depending on clinical and morphological features of EC patients. It was found that none of these parameters was statistically associated with the degree of tumor differentiation (Table 2). However, there was a tendency to an increased level of baseline DNA damage and decreased DNA repair efficiency in EC patients with moderately and poorly differentiated tumors. It was shown that DNA repair efficiency was significantly lower in PBLs of EC patients with deep tumor myometrial invasion (> ½ of myometrium) compared to those with less invasive tumor (< ½ of myometrium) (22.0 ± 6.5% and 43.7 ± 6.7, respectively) (p < 0.05). Upon analyzing the amount of DNA damage by weight excess, higher level of baseline DNA damage was found in PBLs of EC patients with body mass index (BMI) more than 31.0 kg/m2, i.e. in patients with a second and a higher obesity degree (9.0 ± 1.4 and 5.6 ± 1.4% tail DNA, respectively) (p < 0.05). Notes: *significantly different from EC patients with BMI < 31.0 (р < 0.05). **Significantly different from EC patients with depth of tumor invasion < ½ of myometrium (р < 0.05). According to interview results, familial clustering of cancers of the female reproductive system and gastrointestinal tract was identified in 27% EC patients, on the basis of which these women were referred to a group with a FH of cancer. There were no significant association between the level of baseline and 4OHE2-induced DNA damage in PBL and the presence of a FH in EC patients. At the same time, DNA repair efficiency was significantly lower in patients with a FH (20.9 ± 7.8%) than in patients with sporadic tumors (47.1 ± 5.5%) (p < 0.05) (Fig. 2). The data presented indicate the genome destabilization in PBLs of EC patients in terms of the amount of baseline DNA damage, the sensitivity to the 4OHE2 and the repair efficiency of 4OHE2-induced DNA damage. This agrees with the results obtained by us, as well as with the data of other researchers on the state of lymphocytes of patients with tumors of different origin [4–7]. Among the possible causes of genetic instability in PBLs, authors consider the effect of exogenous and endogenous factors, hereditary and acquired defects in repair systems, as well as the effect of reactive substances released into the blood due to metabolic processes in the tumor. The results of this study indicate that the level of genome instability in the cells of EC patients may increase under the influence of estrogen metabolite 4OHE2. It is known that during metabolism, estrogens are converted into a series of intermediate products — 2-hydroxy-, 16-hydroxy- and 4-hydroxyestrogens . According to a number of studies, in patients with hormone-dependent tumors, there is an imbalance of different types of catechol estrogens and the prevalence of 4OHE2 among them, which has the most pronounced genotoxic properties [12, 21]. It can be assumed that the increased level of baseline DNA damage in PBLs of the majority of EC patients may reflect the elevated content of 4OHE2 in their blood. In addition, according to our data, an increased amount of baseline DNA damage is observed in patients with obesity, which is possibly associated with the estrogen synthesis in adipose tissue. In addition, it is possible that one of the reasons for the increased amount of baseline DNA damage is the hypersensitivity of PBLs to the genotoxic effect of 4OHE2 and a reduced repair efficiency of 4OHE2-induced DNA damage. A number of studies have indicated that the level of cell sensitivity to the influence of 4OHE2 is determined by polymorphisms of genes whose products are involved in the metabolism of steroid hormones [22–24]. These include cytochromes CYP 1A1 and CYP 1B1, which catalyze the conversion of estrogens to catechol estrogens, as well as catechol-o-methyltransferase (COMT) and glutathione-S-transferase 1 (GSTP1), responsible for the final stages of inactivation of estrogen. It was shown that the polymorphic variants of the genes CYP 1A1*2C, CYP 1B1*3, COMT Val158Met and GSTP1 Ile105Val are associated with an increased amount of the 4OHE2 in leukocytes compared to cells carrying wild-type alleles . Along with this, the presence of the CYP 1B1*3 Leu432Val isoform is associated with the risk of developing several types of cancer, including EC . Furthermore, it has been shown that an increased level of chromosomal lesions in PBLs of breast cancer patients with polymorphic variant of COMT Val158Met is observed . It should also be noted that increased sensitivity to the 4OHE2 may be caused by impairments of DNA repair systems that are responsible for the recovery of oxidative DNA damage arising under the influence of reactive oxygen species during metabolic transformations of estrogens. The reduced repair efficiency of 4OHE2-induced DNA damage we found in EC patients with deep tumor myometrial invasion suggests that a low level of repair may be one of the factors determining the tumor progression. The data obtained in the present work confirm our previous studies, according to which the PBLs of EC patients are characterized by low repair efficiency of DNA damage induced by bleomycin, the genotoxic effect of which, like the 4OHE2, is associated with the reactive oxygen species generation . The important role of DNA repair in determining sensitivity to estrogen metabolites was observed by several other authors. Thus, Mizutani A et al. reported on hypersensitivity of the B-lymphocyte cell line with defects of DNA repair systems to 4OHE2, which is manifested by an increased number of chromosomal aberrations. In addition, it has been shown that the risk of endometrial and breast cancers is determined by the polymorphism in genes of base (XRCC1, OGG1) and nucleotide (ERCC2, ERCC4 and ERCC5) excision DNA repair [26, 27]. It can be assumed that the inheritance of polymorphic gene variants associated with low-active forms of repair enzymes for oxidative DNA damage may determine the predisposition to hormone-dependent tumors. Perhaps, this explains the reduced repair efficiency of 4OHE2-induced DNA damage in EC patients with a FH. It should be noted that in our previous study using bleomycin as an inducer of DNA damage, low repair efficiency in EC patients with a FH was also noted . The obtained results testify to the significant contribution of the estrogen metabolite 4OHE2 influence to the evolving of genome destabilization in PBLs of EC patients. Decreased repair efficiency of 4-OHE2-induced DNA damage in PBLs of EC patients with a FH indicates a possible pathogenetic relationship between the peculiarities of the estrogen metabolism in women and a hereditary predisposition to hormone-dependent cancers. It is possible that tumors arising against the background of hereditary genome instability may have their own phenotypic characteristics, different from sporadic neoplasms, in which genetic instability occurs under the influence of exogenous factors. To date, this issue remains poorly studied, however, there are the data suggesting certain phenotypic features of tumor associated with expression of protein regulators of the cell cycle in EC patients with a FH . Therefore, the identification of the molecular basis for the genome instability in PBLs of EC patients at different levels of its evolving requires further research. The results of such studies will contribute to the understanding of hormonal carcinogenesis, revealing the mechanisms of interaction between the tumor and the host cells and developing practical approaches for correcting the EC treatment. 1. Lee JK, Choi YL, Kwon M, et al. Mechanisms and consequences of cancer genome instability: lessons from genome sequencing studies. Annu Rev Pathol 2016; 11: 283–312. 2. Hanahan D, Weinberg RA. Hallmarks of cancer: the next generation. Cell 2011; 144: 646–4. 3. Andor N, Maley CC, Ji HP. Genomic instability in cancer: teetering on the limit of tolerance. Cancer Res 2017; 77: 2179–85. 4. Buchynska LG, Brieieva OV, Glushchenko NM, et al. DNA repair deficiency in peripheral blood lymphocytes of endometrial cancer patients with a family history of cancer. BMC Cancer 2014; 14: 765. 5. Najafzadeh M, Baumgartner A, Gopalan R, et al. In vitro sensitivities to UVA of lymphocytes from patients with colon and melanoma cancers and precancerous states in the micronucleus and the Comet assays. Mutagenesis 2012; 27: 351–7. 6. Stefanou DT, Bamias A, Episkopou H, et al. Aberrant DNA damage response pathways may predict the outcome of platinum chemotherapy in ovarian cancer. PLoS One 2015; 10: e0117654. 7. Savina NV, Nikitchenko NV, Kuzhir TD, et al. The cellular response to oxidatively induced DNA damage and polymorphism of some DNA repair genes associated with clinicopathological features of bladder cancer. Oxid Med Cell Longev 2016; 2016: 5710403. 8. Langie SA, Koppen G, Desaulniers D, et al. Causes of genome instability: the effect of low dose chemical exposures in modern society. Carcinogenesis 2015; 36 (Suppl 1): S61–88. 9. Tubbs A, Nussenzweig A. Endogenous DNA damage as a source of genomic instability in cancer. Cell 2017; 168: 644–56. 10. Bolton JL, Thatcher GR. Potential mechanisms of estrogen quinone carcinogenesis. Chem Res Toxicol 2008; 21: 93–101. 11. Samavat H, Kurzer MS. Estrogen metabolism and breast cancer. Cancer Lett 2015; 356: 231–43. 12. Zhao H, Jiang Y, Liu Y, et al. Endogenous estrogen metabolites as biomarkers for endometrial cancer via a novel method of liquid chromatography-mass spectrometry with hollow fiber liquid-phase microextraction. Horm Metab Res 2015; 47: 158–64. 13. Mizutani A, Okada T, Shibutani S, et al. Extensive chromosomal breaks are induced by tamoxifen and estrogen in DNA repair-deficient cells. Cancer Res 2004; 64: 3144–7. 14. Rajapakse N, Butterworth M, Kortenkamp A. Detection of DNA strand breaks and oxidized DNA bases at the single-cell level resulting from exposure to estradiol and hydroxylated metabolites. Environ Mol Mutagen 2005; 45: 397–404. 15. Okoh VO, Felty Q, Parkash J, et al. Reactive oxygen species via redox signaling to PI3K/AKT pathway contribute to the malignant growth of 4-hydroxyestradiol-transformed mammary epithelial cells. PLos One 2013; 8: e54206. 16. American College of Obstetricians and Gynecologists. Hereditary cancer syndromes and risk assessment. Committee Opinion No. 634. Obstet Gynecol 2015; 125: 1538–43. 17. Johnatty SE, Tan YY, Buchanan DD, et al. Family history of cancer predicts endometrial cancer risk independently of Lynch Syndrome: implications for genetic counselling. Gynecol Oncol 2017; 147: 381–7. 18. Buchynska LG, Brieieva OV, Nekrasov KA, et al. The study of mismatch repair in endometrial cancer patients with a family history of cancer. Exp Oncol 2015; 37: 272–6. 19. Buchynska LG, Brieieva OV, Iurchenko NP, et al. DNA damage in tumor cells and peripheral blood lymphocytes of endometrial cancer patients assessed by the comet assay. Exp Oncol 2017; 39: 299–303. 20. Savina NV, Smal MP, Kuzhir TD, et al. Biomarkers for genome instability in some genetic disorders: a pilot study. Biomarkers 2012; 17: 201–8. 21. Brinton LA, Trabert B, Anderson GL. Serum estrogens and estrogen metabolites and endometrial cancer risk among postmenopausal women. Cancer Epidemiol Biomarkers Prev 2016; 25: 1081–9. 22. Martínez-Ramírez OC, Pérez-Morales R, Petrosyan P, et al. Differences in 4-hydroxyestradiol levels in leukocytes are related to CYP1A1(∗)2C, CYP1B1(∗)3 and COMT Val158Met allelic variants. Steroids 2015; 102: 1–6. 23. Liu JY, Yang Y, Liu ZZ, et al. Association between the CYP1B1 polymorphisms and risk of cancer: a meta-analysis. Mol Genet Genomics 2015; 290: 739–65. 24. dos Santos RA, Teixeira AC, Mayorano MB, et al. Variability in estrogen-metabolizing genes and their association with genomic instability in untreated breast cancer patients and healthy women. J Biomed Biotechnol 2011; 2011: 571784. 25. Mizutani A, Okada T, Shibutani S, et al. Extensive chromosomal breaks are induced by tamoxifen and estrogen in DNA repair-deficient cells. Cancer Res 2004; 64: 3144–7. 26. Ming-Shiean H, Yu JC, Wang HW, et al. Synergistic effects of polymorphisms in DNA repair genes and endogenous estrogen exposure on female breast cancer risk. Ann Surg Oncol 2010; 17: 760–71. 27. Sobczuk A, Poplawski T, Blasiak J. Polymorphisms of DNA repair genes in endometrial cancer. Pathol Oncol Res 2012; 18: 1015–20. 28. Buchynska LG, Iurchenko NP, Glushchenko NM, et al. Phenotypic features of endometrial tumors in patients with family history of cancer. Exp Oncol 2017; 39: 312–18.